A Precious Environment: Cooking: Rice Balls for All! 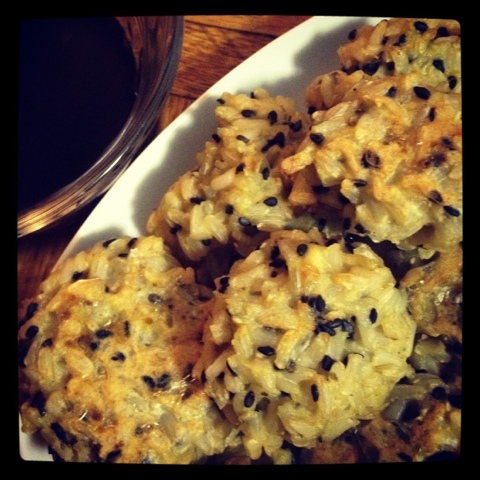 Cooking: Rice Balls for All! A friend had a potluck birthday party the other day, calling for "mini-foods" fitting of her "mini" apartment. There were a million things we could have brought, but this was a foodie crowd, so we wanted to make it a little special. Arancini are delicious little rice balls, with bread crumbs, cheese and usually deep-fried. Perfect! We whipped some up, baked them instead of frying, and they were pretty tasty. To do it again, I would add a little more spice and, probably, more cheese as well. But I've been thinking about them. And I decided to use the leftover rice (that I was supposed to be making fried rice with) to make something kind of fun for dinner last night. We had some pork leftover from Saturday night's yummy dinner (originally ate the loin with collards and cheesy grits) so I decided to make an Asian-inspired sauce to dress it and to make some rice balls to match. Imagine these as a mash-up of the arancini I made on Sunday night and a classic onigiri. dash of - salt, pepper, about a tablespoon of toasted black sesame seeds. Make sure the rice is cool before you begin - if you're in a hurry, as I always seem to be, dump it into another bowl and throw it in the freezer to cool down. In a large bowl, mix together all ingredients. Use your hands. Form the mixture into balls that are about 1 inch round - you can make them bigger or smaller, just make sure to adjust your cooking time accordingly! Pro tip: a bowl of cold water nearby will be useful, dip your hands in if things start getting sticky! Place the balls on a baking sheet and cook for 20 to 25 minutes. Serve with a sauce of your choice (ours was a mixture of soy sauce and spicy-sweet chili sauce) or alone. These are awesome because they are open to loads of variations. What would you add to make them fit your meal?